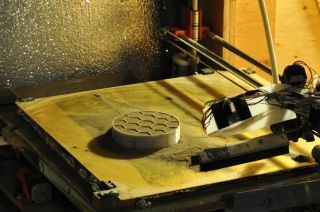 A 3D printer created by the University of Alaska team prints a cone for entry in the Level 2, Phase 1 Compression Test Competition of NASA's 3D-Printed Habitat Competition. The university was awarded $14,070 for this stage of the challenge. The first printing segment of NASA's 3D-Printed Habitat Challenge is now complete, and the U.S. space agency has awarded $100,000 to the two winning teams. When humanity eventually becomes an interplanetary species, settling on Mars and beyond, people will need to use the resources that are locally available as building material for habitats, agency officials have stressed. It would be expensive and unsuitable to ship building materials all the way from Earth, after all. Space industry experts also hope that the 3D-printing technologies developed for space exploration may also be used on Earth in the near term, for building shelters in regions where construction materials are in short supply. By setting up competitions, NASA hopes to attract "citizen inventors" from diverse backgrounds to develop 3D-printing technologies for space exploration. This cone was 3D-printed by the Foster + Partners Branch Technology team for the Level 2, Phase 1 Compression Test Competition of NASA's 3D-Printed Habitat Competition. Foster + Partners scored the most points for this stage, and was awarded $85,930. The 3D-Printed Habitat Challenge has three phases that are working toward this goal. The Phase 1 "Design Competition" was completed in 2015. The Phase 2 "Structural Member Competition" is now underway, with a total prize purse of $1.1 million; it focuses on material technologies that will be needed to build structural components. The Phase 3 "On-Site Habitat Competition" has a $1.4 million total prize allotment and will focus on fabrication technologies when Phase 2 is complete. Phase 2 comprises three subcompetitions, the first of which was this "Compression Test Competition." For this competition, teams were asked to develop 3D-printable materials and to 3D print a truncated cone and a cylinder. Judges then carried out lab tests on the samples and determined a score based on a points system. "Seeing tangible, 3D-printed objects for this phase makes the goals of this challenge more conceivable than ever," Monsi Roman, program manager of Centennial Challenges, said in the same statement. "This is the first step toward building an entire habitat structure, and the potential to use this technology to aid human exploration to new worlds is thrilling." Next, the teams will be tasked with 3D printing a beam that could be used in habitat construction as part of the "Phase 2: Level 2 Beam Member Competition." Once again, the samples will be tested and judged on a points scale. In addition to the winners, the other participating teams are Bubble Base of Winston-Salem, North Carolina; Pennsylvania State University of University Park; CTL Group Mars of Skokie, Illinois; ROBOCON of Singapore; and Moon X Construction of Seoul, South Korea.